What can I tell about a city which captured the heart of millions? People, that is. Amsterdam is a cheeky grande dame who still wears her vintage fur, dyed her hair each week in shocking pink and wear Manolo Blahnik. She is old and graceful yet brimming with exuberant youthfulness. It is a ‘she’, because it has eternal flowing juice of canals, mysterious curves and hidden treasure in unexpected corner. ‘She’ feels like a mother and also a cool Carrie Bradshaw-kinda-gal-friend at the same time. I didn’t know what to expect of Amsterdam when I woke up after a soulful jazz hangover. I went down while my host still sleeping. I found her Mother whom I called Tante (an indissoluble legacy of Dutch colonial past in Indonesia, where young people still call elderly ladies as Tante or ‘Aunt’). She asked questions, I answered, still in pyjama and she in batik sarong. She made me a cup of black coffee while drew in deep breaths of Dji Sam Soe cigarette and told me without censorship what she thinks about our similarity, our beloved Mother Country. I finished my last gulp of cold black coffee when I took a peek at the clock. It was almost mid-day. Time sure did fly generously when she talks. After what appeared to be a battalion of Chinese tourists, I managed to faced the face of ticketing lady. I asked about the Museumkaart and after a quick scan of my then-hopeful-art-lover-with-pitiable-budget-look as well to my soon-to-be expired student card, she gave me a thick envelope with the card inside (www.museumkaart.nl for €15 only per year, you can roam to 400 museums all over Netherland! The best museum card ever). The architecture is unmistakenly modern and was built from the design of Gerrit Rietveld in 1973. There was an additional building behind it designed by Kisho Kurokawa which architecturally opposed with the 1973 built brick building since it was made from titanium and brownish-gray stone which I totally missed while I was there (in hurry to go to Rijks). The tight security was understandable since van Gogh’s painting could be the most expensive pieces on this lifetime (which is absolutely ironic since he almost never sold any painting in his suicidal depressive 37 years old life). The exhibition covers five period of his life from his ‘eureka’ moment on 1880 when he decided to be a painter in Netherland and painted a lot of people eating potatoes that reminded me of Dickensian family in dingy room; Paris Period where he seemed to be in more cheerful mood since he painted with colorful color palette, experimented with pointilism and Japanese artwork; Arles Period filled with sunflowers and the infamous ear mutilation caused by a fight with his then-buddy, Paul Gauguin; Saint-Rémy Period where he was hospitalized and accomplished his awe-inspiring energetic brush strokes with subjects like wheat field, reaper and irises; and ended in Auvers-sur-Oise Period where he created his ‘gothic’ and rumoured to be last masterpiece, Wheatfields with Crows. He ended his life with harakiri style shot in the chest which was terribly heartbreaking since he died not a quick, unpainful death but a slow-two-days-later death. Perhaps his one and ultimate achievement when he breathed his last breath, was Theo. The perfect brother who stand by him along plethoric unrequited loves, impoverished boho-depressive life and dutifully collected all of Vincent’s paintings (which I bet made all of his children and children’s children and children’s children’s children drown in trust funds). The death of this genius, like another eternal mortals with tragic ending such as Elvis and John Lennon, is only providing guarantee that their names would be forever remembered. Nietzsche once said, “You need chaos in your soul to give birth to a dancing star”, and that quote crossed my mind when I was there, gazing at those masterpieces with dreamy eyes and mouth half-open. Oh and the interior. It was a standard wooden-parquet-floored-and-light-color- walled. But who cares about interior design when Sunflower was hanged beautifully in front of your very face (with a perfect lighting design and no glare effect, if I may add). The architecture was very well-planned and perfectly en suite for its purpose of show-casing masterpieces. It felt open, light and spacious. You can see the other side, looking up and down from the staircases to any part and I was quite sure there were at least 200 people or more in that building, but it didn’t feel that crowded. 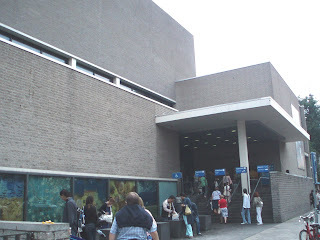 I spent around two-and-a-half hours to gaze adoringly to brushstrokes and textured colors of van Gogh. He is my muse, if ever there is a male muse. I’ve been in love with his works ever since I saw Starry Starry Night poster in my Dad’s room. FYI, I was also in love with The Red Power Rangers around that time. He has period of paintings and I have mine, over him. Now, I am crazy about his Japanese period when he started to imitated Hokusai’s wood-cuts. It’s a beautiful East meet West. 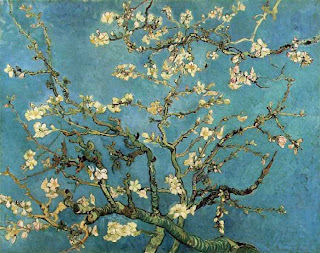 I was almost drooling in front of his Almond Blossom (which of course only could be mine in the form of mass-producted postcard). Another half an hour, I spent unwisely in museum shop. My God, I wanted to buy it all. The books, posters, everything you could think of to print reproductive van Gogh’s paintings, were there. After a fierce battle of common sense and desire, I went out from the museum. I would kill a mouse if I could just taking pictures inside (mouse is my nemesis-ed.). That moment, I understand how so many people seems unable to move away their fingers from camera and try to capture everything. We are afraid to forget. I was afraid I would forget how perfectly van Gogh captured the flight of black crows over swayed wheat grass and exposed his dark side on canvas. NORTH SEA JAZZ …BEEN THERE, DONE THAT!